WILL TWO BUNNIES GET ALONG TOGETHER? Rabbits are naturally territorial and as such may not always be willing to share their space, or your attention, with another bunny. Females that have been raised together may seem inseparable until the hormones develop at four to six months of age and they feel the instinct to nest. At that point they may become aggressive towards one another. On the other hand, many does continue to live happily together forever. Two males will certainly fight when they become sexually mature. 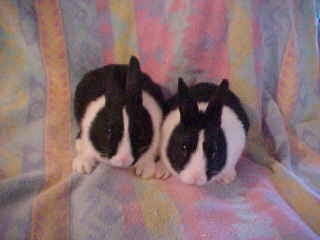 The best two-bunny combination I have found is a neutered male and a female (spayed or not). Or an old doe, past breeding age and a buck of any age. They may continue to mount one another just for old time's sake but without results. Many people are concerned about the bunny being lonely and want to get two so they can keep each other company. As much as I would like to sell bunnies two at a time, I honestly think a single bunny is a better pet. If he has another bunny to entertain him, he doesn't need you! I also can't help wondering if people who are concerned about the rabbit being lonely are already contemplating not having enough time for a pet. One bunny is plenty for a first time bunny owner. Some people get a rabbit and spend a lot of time spoiling it hopelessly (as it should be) and then because of work or school schedules find themselves with less time for the bunny. Feeling guilty about the bunny being lonely, they will then get another bunny to keep them company. Many older rabbits will accept a younger one without too much trouble. You will know right away if it isn't going to work! If the older bunny begins charging and chasing in the first few minutes, they aren't about to share their space! If they greet the new arrival head on and begin grooming, you're home free. Introduction to a new bunny should be done on neutral ground to lessen the instinct to protect one's nest. If all goes well there, it's a good chance they will share quarters as well. Your rabbit may be happy to just have company in a cage next door where they each have their own space but can still nuzzle through the wire. If each rabbit has a cage and territory of it's own, they may play well together in "neutral" ground but again, there are no guarantees. Some rabbits (like people) mate for life and actually become devastated at the loss of their mate making it difficult to find a replacement. Rabbits, depending on how spoiled they are, can be great companions for other pets. I find house cats seem to be the most similar in disposition. They will run and chase one another, chase toys together, groom one another and even share a litter box! Back yard cats can be a "horse of another color", depending on their upbringing. Some will be fascinated by the rabbits and get along real well or some may be very aggressive. Sometimes it depends on how aggressive (and sometimes amorous) the rabbit is that determines how well they will get along. Dogs and rabbits can get along but you must remember that rabbits are a natural prey of dogs and should never be left alone unsupervised. No matter how loving and gentle Fido has always been with the cat and the rabbit, there may come a day when the bunny runs in play and the instinct to chase will take over. Dogs and rabbits require caution. We lost our first bunny when our very gentle Great Dane stepped on him breaking the bunny's neck! The tragedy happened on Easter Sunday in 1973 and we were afraid the experience would leave our five year old son, emotionally scarred for life if we didn't find a replacement immediately! We were living in town at the time and couldn't find a rabbit anywhere close by prompting a 50 plus mile journey to retrieve a replacement (a garden variety New Zealand White). The only bunny in the free world on Easter Sunday more nearly forrty years ago bore a whopping price tag of $25.00! But nothing was more important than protecting our child's psyche. When we returned home and presented our son with the look-a-like bunny we asked what he would name it since the other poor fellow didn't live long enough to acquire a moniker. His reply, "Good Luck! He's gonna need it!" So much for emotional distress! My point is to always expect the worst and you will avoid it happening.